Although the fall and winter are typically known as cold and flu season, there’s another common illness that’s easy to forget about: bronchitis. And because antibiotics don’t work against it, natural home remedies for bronchitis are often the best defense against the hoarse throat and discolored, thick phlegm that mark it. When you have bronchitis, the prime objective is to loosen up mucus and get it moving. You also want to soothe the irritation in your throat so the flare-up moves on as quickly as possible—something that is best accomplished through natural treatments for bronchitis. It’s all about opening up the airways to help you breathe easier and feel better. Soothing the pain and discomfort of bronchitis—itchy throat, harsh coughs, thick mucus and short breaths—is a 24-hour-a-day job that modern medicine isn’t always up to. But by using items you have at home—from food to your shower—you can treat bronchitis naturally and without spending the big bucks. So what are the best bronchitis home remedies? There’s a good chance you’ll have most of this stuff in your home already, but if you don’t you can head to your closest grocery store for all the natural treatments for bronchitis you might need. These 15 methods can show you how to treat bronchitis naturally. 1. A Hot Shower: If you’re looking for some instant relief from your bronchitis symptoms, go turn on the shower. You either get in the water—if you like it hot—or simply stand in the steamy bathroom. Breathing in the steam will loosen up the mucus, helping you get some good coughs out and allowing you to breathe easier. Now you don’t want to burn yourself, so remember you don’t have to get in the water! 2. Inhale Steam: You don’t have to run your shower or get up from what you’re doing to get a similar benefit. An easy home remedy for bronchitis is to fill up a bowl of hot water, lean over it, drape a towel over your head and inhale. Adding eucalyptus or pine oil can help pull mucus and soothe your throat for added benefit. 3. Run a Humidifier: Seeing a theme here? Breathing in moist air is probably one of the most effective natural home remedies for bronchitis. Run a humidifier in your bedroom overnight—or really anywhere in your home at any time—to moisten the air and break up phlegm. Be sure to clean your humidifier regularly, though, because bacteria can accumulate quickly. When it does, it’s dispelled into your home and can cause more harm than good. 4. 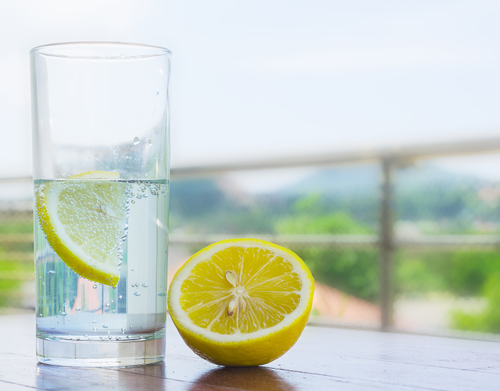 Drink Lots of Fluids: Water and other liquids thin the mucus in your throat and nose, so they’re an effective way to treat the nasty symptoms of bronchitis. You can get some added benefits from drinking hot liquids like tea or soup. Try to limit the intake of alcoholic or caffeinated beverages because of their diuretic properties. Even though they are liquids, they can dry you out, which is counterproductive to your goal. If you have a coffee or a hot toddy, make sure to drink some extra water to make up for it! 5. Add Some Spice to Your Diet: If you don’t like spicy foods, don’t worry—bronchitis can dull your taste buds! Capsaicin, found in chili peppers and most spices that add a little zing to food, is an anti-inflammatory that can help with a sore throat brought on by bronchitis. There is a possibility that it can help thin out mucus and open up your airways, but scientific results conflict. But if you ask me, there’s no harm in trying! 6. Mullein Tea: Mullein is a traditional folk remedy that might help cure mucus from lungs. It’s been used as a natural remedy for centuries to clear respiratory infections, and likely works because it’s typically consumed warm. Mullein also has compounds that loosen phlegm and soothe mucous membranes, making it valuable in the fight against bronchitis. Drop two teaspoons of dried mullein leaves into a cup of hot water and let it steep for 10 minutes. Strain out the leaves and drink it up to three times per day. 7. Ginger Tea: Known for its immune boosting and anti-inflammatory effects, ginger tea can offer some natural relief from bronchitis. It can help tame inflamed, swollen bronchial tubes. You can try adding a half teaspoon of ground ginger and cinnamon to a cup or hot water or almond milk. Stir it well and sip on it. 8. Garlic: One of nature’s true healers, garlic can help naturally treat bronchitis by employing some powerful antiviral and anti-inflammatory properties. Add a little to your diet or take it in capsule form when symptoms strike. 9. Honey: Honey has antibacterial and antiviral properties that can help with bronchitis, but it can also help coat your throat to relieve irritation. Add it to tea, water, or put it on food to enjoy its benefits. You can also take it straight if you like! 10. Probiotics: Taking capsules or eating probiotic-rich foods like yogurt, kefir or kimchi can help treat bronchitis naturally. Probiotics are “good bacteria” that can help strengthen your immune system so it’s less susceptible to viral infections. 11. Ginseng: Ginseng can also help boost your immune system to combat infection. If you’ve already got bronchitis symptoms, it may stop them from worsening by reducing inflammation. If you take it in capsule form, use 400 mg per day. 12. Oil of Oregano: This stuff can fight a sore throat quickly, making it a great natural treatment for bronchitis. It’s also useful in fighting coughs. Oregano oil can be taken in capsule form or raw. If you take raw, simply put about a teaspoon of oregano oil under your tongue. Do this or take a capsule once per day. You’ll burp up the flavor, so you might want to take it with, or just before, a meal. 13. Salt Water: Gargling with salt water can help treat bronchitis by cutting through the mucus that’s causing throat irritation. Add about a teaspoon of salt to some water and gargle it around. Be careful on how much salt you use, because too much can add irritation. After experimenting with one teaspoon, adjust the amount by adding more or less until you get adequate results. 14. Turmeric: Turmeric can help offer relief from a bronchitis-associated cough by drawing out excess mucus. Adding a teaspoon to almond milk or water, stirred well, can offer some benefits. Drink it on an empty stomach for the best results. 15. Avoiding Dairy: Although not a natural remedy per se, avoiding dairy can help reduce overall mucus production. This is key when you’re battling bronchitis because the less mucus, the better. If you want to drink milk or eat cheese during a bout of bronchitis, drink almond or other nut milks, and stick to lactose-free cheeses. These cheap and cost-effective natural remedies for bronchitis can keep your airways clear, remove mucus, and help you stay as comfortable as possible. Because antibiotics don’t really work in treating this viral infection, natural treatments really are your best bet. Now it’s always good to have reliable natural treatments, but prevention is always the best way to ensure health. So if you smoke, stop; smoking is major risk factor for bronchitis. Another preventative measure is to make sure you wash your hands regularly, cleaning away any potential exposure to the virus. Is Bronchitis Contagious? How Long Will I Be Contagious? “Natural Home Remedies: Bronchitis,” Best Health Mag web site, last updated November 27, 2015; http://www.besthealthmag.ca/best-you/home-remedies/natural-home-remedies-bronchitis, last accessed February 8, 2016. “25 Home remedies for bronchitis,” Home Remedy Shop web site, September 2, 2014; http://www.homeremedyshop.com/25-home-remedies-for-bronchitis/, last accessed February 8, 2016.